Why are some of my pics small and some of my pics are big? I can't be sure, but I hope you can enjoy them anyway! Last fall my dear little Elizabeth started her first year of preschool. 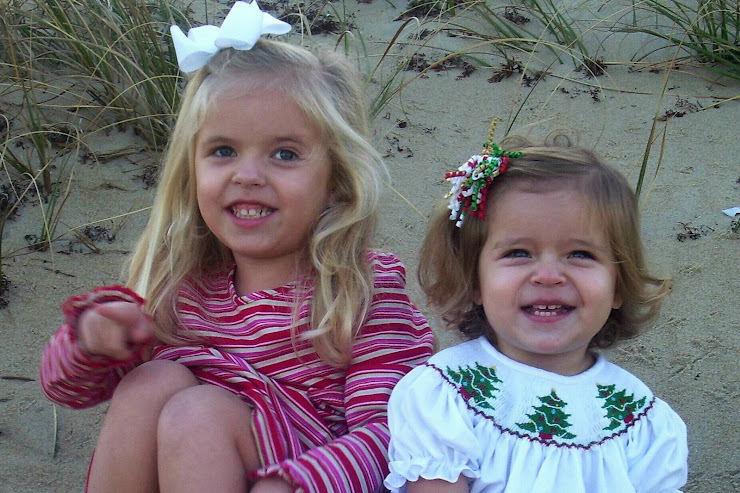 She attended St. Andrews Preschool in Nags Head. Last fall I also began working at the Preschool in the parents-morning-out program on T and Th mornings from 9-12. The WONDERFUL thing about this is that Anna Belle comes to work with me and has made some wonderful new friends and has learned to share and play with other children her age. I have also made some wonderful new friends. It has been GREAT! I am very thankful that God has put this opportunity into our lives. The year is coming to a close. The last day of preschool is coming soon. Next year I will be working there again, Anna Belle will come with me to class and Elizabeth will have one more year of Preschool before she goes to kindergarten, which is good for me b/c I am not quite ready for the kindergarten thing. Elizabeth also began ballet lessons last fall at Island Dance. She has very much enjoyed it and has also made some new friends. Dance for the year was right after preschool on Wednesdays which made it a little rushed, but the fun thing is that I would pack Elizabeth's lunch for her and we would picnic with our friends before dance. That was really fun and we made many memories. One of her very special friends is Emma who we would picnic with every week. The recital was just this past weekend and it was fun. Elizabeth was SO excited to be on stage and wanted to be on stage again and again! She LOVED it. Maybe we will dance again next year.